The National squad, above, won the Washington C.H. Little League’s Minor Division all-star game, 16-15 Monday, July 18, 2016 over the American team. The team is pictured prior to the game on the field at Lewis Street. (front, l-r); Aiden Osborne, Cooper Robertson, Brayden Feibelkorn, Jameson Hyer, Lafe Coleman, Cameron Morton; (second row, l-r); Lydia Gibson, Kobie Hyer, Ethan Turley, Cooper Enochs, Ian Spiess, Cody Moore; (back, l-r); coaches Josh Morton, Jimmy Enochs, Jeremy Hyer, Aaron Robertson and Steve Osborne. The Washington C.H. 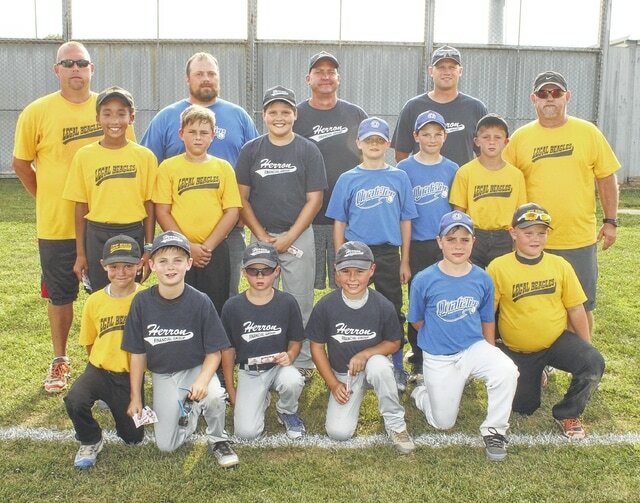 Little League held its annual Minor Division all-star game Monday evening. The game featured the top 24 players in the Minor Division, split into two squads of 12, the Nationals and the Americans. The National squad defeated the American team, 16-15. Runs were limited to five per inning. The National team scored five runs in the top of the first. After the American team did not score in the bottom of the first, the National team tacked on one run in the top of the second. In the bottom of the second, the American team answered with five runs to make it a 6-5 ballgame. The National team scored three in the third, with the American team not scoring in its half of the third. The Nationals scored two in the fourth to one for the American squad, giving the Nationals an 11-6 lead after four innings of play. The Nationals were scoreless in the top of the fifth and the American team took advantage, scoring four runs in the bottom of the fifth. After five full innings, the Nationals led the Americans, 11-10. Both teams scored five runs in the sixth inning to make the final 16-15, Nationals. Cooper Robertson led the National team with three hits. Aden Osborne, Lafe Coleman, Cam Morton, Ethan Turley and Kobie Hyer each had two hits for the National team. Lafe Coleman and Cooper Enochs led the National team in scoring, each with three runs. Lafe Coleman hit two triples and Ethan Turley and Cooper Enochs each hit one double. For the American squad, Jakob Hoosier, Landon St.Clair, Bryson Heath, Jake Bashor, Gavin Coffman and Noah Haithcock each had two hits. Jakob Hoosier scored three runs, while Bryson Heath, Gavin Coffman and Noah Haithcock each scored two runs. One of Jake Bashor’s hits was a triple. Offensively for the National all-stars: Aden Osborne, 2-5, 1 run; Jameson Hyer, 1-4, 1 run; Lafe Coleman, 2-4, 3 runs, 2 3b; Cam Morton, 2-4, 2 runs; Ethan Turley, 2-4, 2 runs, 1 2b; Cody Moore, 2-4, 1 run; Cooper Robertson, 3-4, 2 runs; Cooper Enochs, 1-4, 3 runs, 1 2b; Lydia Gibson, 1-2; Ian Spiess, 0-2; Kobie Hyer, 2-2, 1 run; Brayden Feibelkorn, 1-2. Offensively for the American all-stars: Jakob Hoosier, 2-4, 3 runs; Landon St.Clair, 1-4, 1 run; Bryson Heath, 2-4, 2 runs; Jake Bashor, 2-4, 1 run, 1 3b; Trey Robinette, 1-4, 1 run; Gavin Coffman, 2-4, 2 runs; Javin Baker, 0-3; Asher LeBeau, 1-1, 1 run; Kaden Brill, 1-1, 1 run; Noah Haithcock, 2-3, 2 runs; Isaiah Wilson, 0-2; Frank Maddux, 1-2, 1 run.